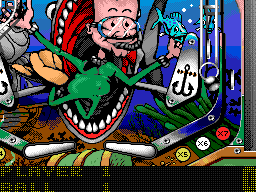 A bit slow compared for example to the CPC Pinball Dreams release, but understandable since Sam Coupe has no hardware scrolling and even 24kb of videoram to move. Thumb up for the platform and the idea. Unfortunately it shows also lacks of SAM Coupe. Anyway great to see somebody doing things for this mysterious machine. page created in 0.014383 seconds with 15 queries.